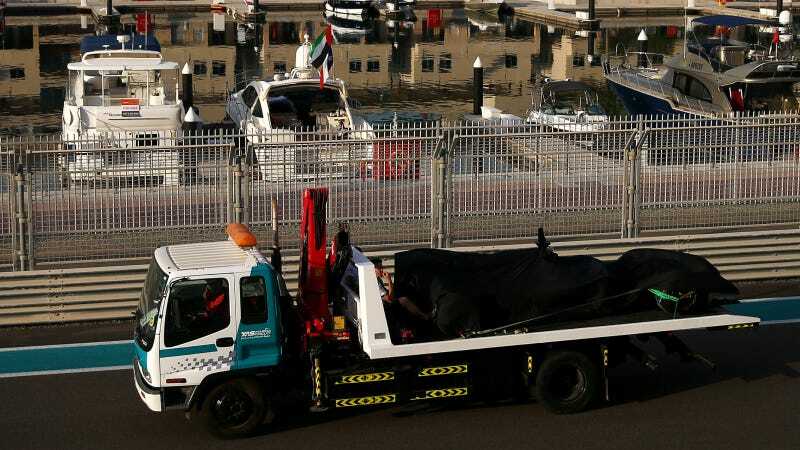 Poor McLaren spent more of its time in the garage and on a flatbed yesterday as opposed to actually driving during the Abu Dhabi Formula One test day. GP2 series runner-up Stoffel Vandoorne couldn't even lay down a flying lap in the McLaren MP4-29H1x1 text car. 2015 F1 testing began this week at Abu Dhabi. A delighted Sebastian Vettel was seen hanging out with his new teammates at Ferrari despite Red Bull not releasing him from his contract in time to run the tests. Valtteri Bottas set the fastest lap in his Williams. But the real story wasn't was on track so much as who unexpectedly wasn't. The McLaren Honda MP4-29H1x1, the same 2014 car stuffed with the 2015 Honda engine that previously ran at Silverstone, had an issue with some of the electrical grounds. "We are triple-checking some electrical issues we may have with the ground, particularly, which is a part we have built as McLaren and we just want to be very careful," explained McLaren racing director Eric Boullier to Crash.net. "The minimum is you may burn the harness but you could also damage any ECU's or this kind of thing. So we just want to make sure we triple-check. Leaving the garage at nine or ten or twelve or one doesn't change anything." Finally, after chasing down the gremlins enough to feel okay letting the car out on track, McLaren test driver Stoffel Vandoorne only had three hours of track time left to go. The car continued to have problems on track, which resulted in Vandoorne could getting three untimed laps in the car. McLaren may be a bit overly cautious in keeping the car off track for so long, but it's for good reason. "We all want to go into Melbourne thinking we can win the race," explained Boullier, as quoted on James Allen on F1. "I know we can dream, but we are pushing to have this target because it's the only way for us to deliver what we want." Now it's time to look to the future with optimism and prepare for 2015 in a better way. We need to see how things go for everyone next year. Mercedes definitely have a big advantage and they will probably carry this advantage into next year. But I will join a project that is not for next year only, it is a long-term relationship and it is a project which will hopefully challenge Mercedes soon and this is why I have made this decision. I am looking forward to the future with enthusiasm because when you join a new project it is because you think it is better. We hope it's better, too. Someone needs to provide a worthy adversary to Mercedes' dominant power units. It might as well be McLaren Honda. ...if they can get the car to run. Pobrecito.